Pointed toe. Very nice used condition with mild signs of normal previous use. Toe of L shoe has a tiny nick. Black leather uppers. Made in Italy. Leather soles. Style: Basket Weave Heels Daamsel. Condition: Gently Used (Minor wear on heels, see photos). Only worn once for a wedding. No flaws or defects. Lace pattern over white silk material. Gorgeous shoes! I threw away the box. Pi nk f lo ra l wi th m es h si de s, b ow o n he el, le at he r so le s, 3. 5 i nc h he el h ei gh t.
Colors are green, white, purple, black, yellow and orange. Shoe is trim with orange leather. New with box. This style is similar to ballet flats but with a heel, really cute and unique. Previously loved Madden Girl pumos. These shoes are peep-toe heels with a fun abstract fabric design featuring purples, black, white and tan colors. - Flaws noted:shoes have been previously worn, as such the soles and heels show signs of wear, as well as the interior of the shoe (see pictures). Pointed Toe. Bright Pink Satin, These shoes were dyed to match an outfit. 3" Narrow Heel. 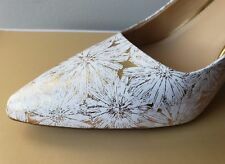 New ListingManolo Blahnik shoes SZ 40. Manolo Blahnik shoes SZ 40. . Condition is Pre-owned. Shipped with USPS Priority Mail. 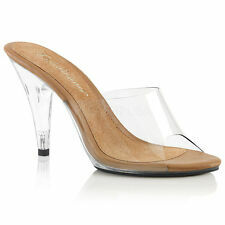 New ListingStuart Weitzman Slingback Heel Womens Size 8.5B Gold Patent Open Toe Spain EUC! Stuart Weitzman Slingback Heel Womens Size 8.5B Gold Patent Open Toe Made in Spain $398 retail EUC!. BARELY WORN VERY NICE!Condition is Pre-owned. Shipped with USPS Priority Mail. Donald J Pliner Silver-natural/Sand Woven Cork Slingbacks, 9.5 . Condition is Pre-owned. Shipped with USPS Priority Mail. They have a double strap across the toes and a curved strap up the side of the foot. The sandals have a high 3" heel. Designer: Naturalizer. Style: Strappy slingback sandals. Uppers: Leather. Color: Gold. 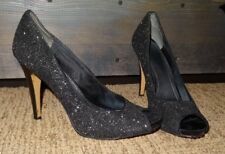 New ListingFranco Sarto Black T strappy sandals heels- Brand New Never worn Size 8.5M. Your gonna LOVE these heels! They are SUPER CUTE! They have never been worn. Body changes prevent me from wearing them. I paid top dollar. My loss is your GAIN! Pointy Toe. Heel 3.75". Black Leather. BCBGeneration Black Leather Peep Toe High Heel Booties Zip Size 8.5/ 38 1/2. Condition is Pre-owned. Shipped with USPS Priority Mail. Bought several pairs of shoes to wear with a dress. Ended up wearing a different pair. LULU GUINNESS LULU GUINNESS. LEATHER SOLE LONDON. Michael Kors Black Patent Leather Heel 6M. Condition is Pre-owned. Shipped with USPS Priority Mail.